The NEC lasted for some 8 and half hours – the sandwiches and tea had been provided but the staff, due to massive pressure of work at the moment, were unable to organise sleeping bags. Jeremy Corbyn was present from beginning to end. As you will see, in some ways this was a totally unique meeting. Only Mary Turner was not present. Mary is still too ill to attend and the NEC sent its love to Mary. The main business of the meeting was a ‘blockbuster’ paper from Tom Watson. This made a whole series of fundamental proposals, mostly involving putting rule changes to annual conference in 5 days time. In all my 36 years on and off of all four of the Party’s national committees, I have never seen one paper making so many far reaching proposals. The first time some of us saw Tom’s paper was when we sat down at the table, although we were told that it had been emailed out late on the eve of the NEC. Party leaders in Scotland and Wales have an open invitation to attend the NEC and Kezia Dugdale had taken this up and was present throughout the meeting. Jeremy opened by wholeheartedly thanking our staff for the huge amount of work they had done during the leadership campaign, which was well beyond the call of duty. This was endorsed by the whole NEC. Jeremy then gave a brief account of the leadership campaign and he highlighted the many large rallies that he had attended. He had learnt a lot from meeting a wide range of the public and pointed out that they were from a wide representation of Labour supporters. Indeed, in Thanet many working class former Labour voters attended who had voted for Farage; Jeremy had made a particular point of engaging with them. Jeremy then turned to the way forward in the Party and the need to have a unified front against the Tories. He reaffirmed that he was always prepared to reach out to those who do not agree with him, and he accepts that some of them will never agree with him, but he pointed out that this had to be a two-way dialogue; Jeremy added that at the last NEC he had said that there should be mediation and negotiations between the leader and the PLP. These have not yet properly taken place, and he stressed that they should take place. He wanted the whole PLP to work together and for an end to unattributable briefing. In relation to the Party itself, Jeremy argued for the NEC to have a special Away Day to focus on Party democracy and also how the Party should more effectively relate to communities. He stressed that there needs to be considerably more working class, women, BAME, LGBT, and disability representation in the Party and throughout society. Jeremy then turned to the Shami Chakrabarti Report and the series of recommendations from Shami. Jeremy emphasised that the NEC and our annual conference must endorse Shami’s key recommendations. He then moved that the NEC take this action. The NEC then agreed to develop Shami’s recommendations further and to immediately put into practice the principles contained in recommendations 1-7. Jeremy then stressed that the draft code of conduct in relation to social media in particular and the media in general needs to be progressed (this was addressed later in the meeting). Jeremy then reported that he has given particular attention to the Brexit process and negotiations. The Tories are making a mess of the whole issue; our frontbench and Party is therefore in a strong position to have a major influence. Jeremy has a meeting arranged with Martin Schulz to discuss the most effective way Labour can influence the negotiations so that we can advance Labour’s key issues. Jeremy has also commissioned a report on the Norwegian settlement to see what can be learnt from that. Jeremy ended by saying that after Saturday we must bring the Party back together in order to fight the Tories. He drew attention to that fact that there is wide agreement within the Party on policy, e.g. on grammar schools, anti-austerity, defence of the NHS, social housing, workers’ rights, and on the threat to human rights (Jeremy stressed that he will keep pressing for justice for the Orgreave and Shrewsbury trade unionists). He pointed out the defence of human rights was the reason he appointed Shami Chakrabarti to the House of Lords. Several NEC members responded to points of Jeremy’s presentation. In particular, there was total agreement around the table that after Saturday we must all come together. In response Jeremy reported that John Prescott had been particularly helpful and had been discussing how to build a basis for Party unity. Jeremy made it clear that he had never publicly criticised staff and never will. Indeed, he hoped to have discussions with the staff reps about any issues of concern to the staff, but he pointed out that the NEC is responsible for the staff, not the leader. Jeremy welcomed all of the diverse groups and organisations within the Party and he pointed out that he had even spoken at a Progress event. As Margaret Beckett had informed us earlier, this was one more Progress event than she had ever spoken at. Jeremy endorsed the comments made by the NEC trade union reps that the Party needs to give more commitment to the situation faced by young people. As Jeremy said, they are often in a very vulnerable position – zero-hour contracts etc. – and that Young Labour should give the plight of many young people particular attention. All but one of the papers from Tom had been circulated well in advance and the NEC examined them in turn. There were papers from the Party Reform Working Group giving an update on the progress that had been made, e.g. gender representation, youth review, engaging young members and the implications of devolution. The NEC then took decisions on the following specific papers. 1. Safeguarding and child protection policy within our Party, including a detailed code of conduct. After discussion the code of conduct was agreed. 2. Social media-code of conduct. The principles in this paper were agreed, but it was acknowledged that much more discussion and action is required on the use of social media and relations to the press in general. These principles included a commitment to give our members and supporters the tools to disseminate our positions and policies and a commitment to encourage debate, discussion and feedback. The NEC to establish a formal policy-making Women’s Conference. This proposal had come from the gender representation Party Reform Working Group. This was immediately endorsed. ALC places on the NEC to be increased from 2 to 3 seats. An additional seat on the NEC with voting rights for Police and Crime Commissioners and Combined Authority Mayors. A seat with voting rights to be allocated to the leader of each of the Scottish Labour Party and the Welsh Labour Party. The Scottish and Welsh executives to administer the procedures and selection of Westminster Parliamentary Candidates in Scotland and Wales. This was agreed in principle by the NEC. Our Party to introduce a bursary scheme to support members seeking selection to Parliament from working class and low-income backgrounds. This proposal had been welcomed at a previous NEC and was re-endorsed. I repeated my suggestion that the bursaries should be named in permanent memory of Jo Cox. In order to maintain the balance on the NEC there should be two further seats for trade unions, increasing the trade union representation from 12 to 14. (However, there was no proposal to increase the CLP seats from 6, this despite the doubling of our membership to over 500,000.) In addition, on entering the room the NEC was handed a paper from the Party Staff Joint Trade Union Committee requesting two seats on the NEC for the staff. In their paper, the staff drew attention to Theresa May’s warm words about workers on company boards. Election of Shadow Cabinet. The paper argued for a rule change in 5 days time and two options were put forward. Option 1: Shadow Cabinet to be elected by the PLP. Option 2: “Hybrid Shadow Cabinet” to be elected by 3 equal voting blocs – MPs/MEPs, members (by OMOV), and appointments by the leader. Remove ‘registered supporters’ from voting. Move to an electoral college with an affiliated section covering TUs and affiliated societies. Move to an electoral college which would include a section for MPs/MEPs (as in the past). I made the point that it is totally unacceptable to make decisions of this far reaching nature without more detailed consideration. This issue of irregular process was also raised by Ann Black, Diana Holland, Jennie Formby, Martin Mayer, and Jim Kennedy. I pointed out that in the past when CLPs have requested more seats for CLP reps, they were always told that the NEC had been put together after much thought, and was a balanced and long term settlement. This description could hardly be applied to Tom’s proposals. The argument that was made by many members (including me) was that faced with so many far-reaching proposals it was important to have sufficient time for consideration and considered discussion, in order to arrive at a balanced structure that would be generally acceptable. Others wanted urgent action. The discussion on this basic division lasted for rather a long time. Paddy, a very experienced Chair, felt the best way to make progress was to agree things we could all agree upon, and then address the contentious issues. The proposals that we could agree upon were those that came from various Party Reform Working Groups, and are covered elsewhere in my Report. Paddy proposed that the extra seats for councillors, PCCs/Combined Authority Mayors, trade unions (and hopefully CLPs, if the 6 new reps have anything to do with it! ), and also consideration of the system for electing the leader would all be referred to a future Away Day. On the proposal for seats for the Leaders of Scottish and Welsh Labour Parties it was agreed that this would be debated at this meeting. I am sure everyone around the table agreed with the principle of this proposal, but many of us felt that the discussion should be taken alongside the other proposals at the Away Day, so that we can have an overall agreed package. During the debate Kezia made an impassioned speech of which Gordon Brown would have been very proud. Kezia informed us that the whole Party in Scotland was united behind this proposal, that it was urgent, and that it would be a vital way of our Party showing its commitment to Scotland. On being put to the vote, the proposal was carried 16-15, and thus there will be rule change at Liverpool to give NEC seats to the two Leaders. On the issue of the election of the Shadow Cabinet, much of the debate centred around whether rule changes should be brought to the NEC meeting on Saturday (4 days time) or whether more time should be left for negotiations. I gained the impression that everyone around the table was committed to negotiations between the Leader’s team and the PLP, in order to find an acceptable arrangement that would be acceptable to all sides, and would help to unify the Party. In his contribution, Jeremy made it clear that he wanted to offer an olive branch (he is growing an olive tree on his balcony) and thus fully supported negotiations. But he felt that insisting that negotiations must be concluded by Saturday was unrealistic. The debate on whether negotiations should be concluded by Saturday was fervently debated for rather a long time. Eventually Paddy insisted that a decision be taken. By 16-15 it was agreed that although a report of the progress of the negotiations would be given on Saturday, they would not be arbitrarily foreclosed but would continue until a unified settlement was reached. In other words, there was no time limit on the negotiations. Although Harry had been sat outside the door for at least 7 hours, he looked as dapper as ever. Harry took the NEC through the whole programme and arrangements for annual conference (all contained in the Delegates’’ Report, which is on Membersnet). I put two important questions to Harry. The first related to the East Devon CLP rule change which the CAC had determined was out of order under the 3-year rule. In support of this, the CAC had quoted the Collins Report. I pointed out that the new 3-year rule only applies if there had been a rule change on a similar subject voted on in the last 3 last years. But the Collins Report did not properly cover a similar issue and more importantly there had been no vote as a consequence of the Collins Report on a rule change on a similar issue. In response, Harry confirmed that he would ask the CAC to consider my point at some future date. Secondly, I said that I had heard that the CAC had considered some 25 contemporary motions on the issue of suspensions, exclusions, etc. during the leadership campaign. I further heard that the CAC did not accept these as contemporary motions and had referred them to the NEC. So I asked why they were not in our pile of papers today. Harry assured me that they would soon be available for the NEC’s perusal. The NEC then considered all of the procedural, technical, and security issues related to Annual Conference. I asked if it would be possible for the merit award winner to be asked to say a few words to conference. This had been the case for 94 years until Blair became Leader. The General Secretary, Iain McNicol, made a positive response, and will look into the practicalities. The NEC had before it a paper from the office covering the four different rule changes from CLPs that would be timetabled at Liverpool together with the rule changes that were sent in this year and will go to the 2017 conference (under the 1968 Convention). As has been the habit for many years, the CAC had recommended that all of the CLP rule changes at Liverpool should be opposed by the NEC if the movers refused to remit. Given the lateness of the hour, I felt it wise to only try to overturn the office on one of the rule changes. Darren Williams and I therefore proposed that the NEC should support the rule change submitted by Sheffield Heeley. Sheffield Heeley rule change provides for a vote in parts on huge NPF documents, which at the moment are put to conference on a take-it-or-leave-it basis. This very small reform has often been demanded by the TUs. The idea of voting in parts on huge document was included in the Partnership in Power agreement in 1997, but for some reason has never been implemented. The platform has always insisted that conference has to vote on a take-it-or-leave-it basis. Darren and I’s proposal was supported by reps from Unite, CWU, TSSA, and the Bakers Union. Unfortunately, it was apparently too radical for many of the NEC. On being put to the vote, it was tied at 15-15. Thus at Liverpool the NEC will oppose this very small but democratic proposal. Councils and Labour Group Executives should reflect the wider community. And the gender balance of the Executives should reflect the group as a whole. Combined Authority Mayors and PCCs should be accountable to CLPs, Labour Groups, and Affiliates. They will make regular reports to these units and also to the appropriate Regional Conference. Combined Authority Mayors and PCCs to uphold Labour’s commitment to diversity and underrepresentation in any appointments they make. ALC levy payments to be made by regular direct debit. Family members should not sit on assessment team interview panels for their own spouses or relatives. All assessment team interview panels should be chaired by somebody from a different local authority area. Sitting councillors should face an assessment interview at least every two terms. Work to phase-out all male-member wards. To further consider representation on NPF for councillors and ALC elected representatives (the NEC felt this needed further discussion). Glenis Willmott presented a written report. This emphasised that at Brussels the EU governing bodies and bureaucracy were still clouded by uncertainty and doubt regarding the Brexit saga. Glenis gave details of the initial moves that are being made at Brussels. Labour’s MEPs had outlined to the commission President, Jean-Claude Juncker, the multiple challenges of Brexit, pointing out that if it was done hastily the consequences could be disastrous. The list of issues that will need to be settled is huge, and every day new problems are discovered, none of which were ever mentioned by the Leave campaign. Leadership and internal elections. Iain gave a detailed report of the work undertaken by the staff relating to the elections. He paid tribute to the enormous contribution made by the staff and also by several NEC members. Several NEC members raised the contentious issues around suspensions (including suspensions of CLPs), expulsions, etc., particularly drawing attention to some disciplinary actions which seemed to be justified on trivial grounds. Iain accepted that given the sheer volume of the work, it would not be surprising if some mistakes had been made. He pointed out that no decisions are made by the staff; all final decisions are made by NEC panels. A report of the outstanding cases will be brought to the Disputes Panel as quickly as possible. Iain drew attention to the 31 identical rule changes that have been submitted this year stipulating that the incumbent leader or deputy leader will be automatically included on the ballot if they are challenged and there is a leadership contest. It was vital that the rulebook is crystal clear on this matter to avoid any timewasting challenges in court. Iain wanted this issue put to conference at Liverpool as a rule change, to settle the matter once and for all. This was agreed. Streamlining the varied membership rates to 3 categories, Standard, Reduced, Introductory. This was agreed. Batley and Spen CLP by-election. Iain presented a paper setting out the timetable for this by-election, resulting from the terribly tragic circumstances. International Report. Iain asked our International Officer to present her report and thanked her for being so patient and waiting 8 and a half hours. The Officer then reported on all of the international visitors that would be present at conference, and on the international speaker to conference. In view of the lateness of the hour, the International Officer proposed that other issues in her report be postponed to a future NEC. This very generous proposal was met with overwhelming acclamation. Good report Pete. I would be interested to know how some of the union reps voted. I wonder if the real reason for the secret ballot in July was to do with reps voting against their organisation’s line. Rather concerning that the Scots and Welsh leaders are to be on the NEC. Luke A is crowing that there will be a narrow anti-JC majority (even though all 6 of the reps directly elected by the membership are pro-JC). I would hope that conference votes down this proposal. John Burgess seems to have removed this particular item from his blog… have you seen anything which corroborates what he had said? I too hope that Conference votes down the proposal. First, if carried it would wipe out the much-prized Left gains and obliterate the hope of an NEC more supportive of JC. Secondly the NEC should consist overwhelmingly not of leaders but of representatives of the rank and file subject to annually (or at worst biennially) contested elections. In this regard there might have been an arguable case for expanding the Constituency Section to include two rank and file reps from the Scottish and Welsh CLPs. But this emphasis on the inclusion of leaders is more of the “Stakeholders’ NEC” ushered in by Blair. It stinks. This is an excellent and detailed report which I recommend all Party members to read before Conference. The NEC should be entirely elected by the membership with the exception of the Leader and Deputy Leader. The membership would take account of the various interests of candidates. For example I would be keen to ensure in casting my vote that Trade Unions. LGTG etc members were elected. The Labour Party should become a membership lead organisation at every level. Yes should refer the Scottish, Welsh Leaders being on the NEC back to the NEC and just have 2 councillors (or perhaps one) on the NEC. The Right are up to their wheeling and dealing tricks but we should be arguing because of the massive increase in membership for 12 CLP grassroots reps on the NEC (and 1 should be from Scotland and 1 from Wales) and MPs, MSPs etc.are not be allowed to stand for CLP places. The NEC should be grassroots-led! Thanks, as usual, for the rapid feedback from NEC meetings. I hope that we will have one, as usual, from Ann Black as well. 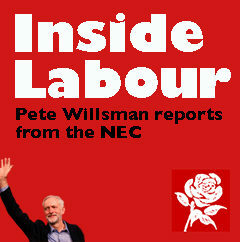 Peter says “The first time some of us saw Tom’s paper was when we sat down at the table, although we were told that it had been emailed out late on the eve of the NEC”. It is clearly outrageous not to circulate proposals for rule changes well in advance in order to allow time for reflection, discussion and responses. Does the NEC have no rule on this? Is it not bound by the LP rule book the model rules for all party units require that motions for consideration are circulated 14 days before being discussed at a meeting? What are the rules specific to the NEC which allow for procedures completely contrary to this? It is difficult to say in the absence of the publication of any such procedures. Peter reports “Jeremy added that at the last NEC he had said that there should be mediation and negotiations between the leader and the PLP. These have not yet properly taken place, and he stressed that they should take place”. Was there an explanation as to why they have not taken place? What is the nature of the mediation proposed? There will be large numbers of people interested in knowing the answers to these questions. Jereny Corbyn also “stressed that there needs to be considerably more working class, women, BAME, LGBT, and disability representation in the Party and throughout society.” What is meant by “working class” in this context? A teacher? A computer programmer? A TU official? The term is now next to meaningless in LP debate, or so it seems to me. I would be delighted to be corrected on this point. It seems as though there was little discussion on Shami Chakrabarti Report. This is a shame because while I agree with it main recommendations it did not set high standards for a report on such matters. Much of it has a slender research base and is couched in terms of subjective impressions. Did no one raise this point? However, recognition of the need for agreed protocols in the use if digital media is long overdue and very welcome. I would really like to see the details of the “commitment to give our members and supporters the tools to disseminate our positions and policies and a commitment to encourage debate, discussion and feedback” (mentioned later in Peter’s report. When are we likely to get the details? Is it true that there is “wide agreement within the Party on policy, e.g. on grammar schools, anti-austerity, defence of the NHS, social housing, workers’ rights …”? There only agreement on not extending grammar schools but not on getting rid if them by ending selection. This has been a running sore in Labour’s schools policy for decades and it still is. Similar points can be made about the other items. We should not confuse Owen Smith’s left-leaning rhetoric (necessary for purposes of the leadership election) with a commitment if the Labour right to the things that he says. If the present war of attrition continues and if it results in the replacement of a left-wing leader can there be any doubt that most of the commitments dear to the left will be dumped in double-quick time? I don’t understand how there can be “a formal policy-making Women’s Conference” the proposal for which was apparently “immediately endorsed”. There can only be one process for making policy and everything from different sections of the party must go through that process, as required by Labour’s rules. On the changes to the composition of the NEC I would like to have heard about discussion of its overall balance in which LP members and those directly elected by them should, in my view, be the largest group. What seems to have recurred is the pushing of claims for separate interest groups. I really don’t like the idea of place on it “for Police and Crime Commissioners and Combined Authority Mayors”. Peter says “there was no proposal to increase the CLP seats from 6, this despite the doubling of our membership to over 500,000”. Why was there no such proposal? NEC composition should surely be a subject for widespread discussion throughout the party and not something dealt with in this ad hoc manner (as Peter says). I hope that this is understood and that the matter is not consigned to an NEC “away-day”. The proposal for NEC places for the Welsh and Scottish leaders was carried 16-15 but I was surprised to read “thus there will be rule change at Liverpool to give NEC seats to the two Leaders”. Doesn’t Conference have the power of decision? The exchanges on the Conference Arrangements Committee report seemed to be full of fudge and evasion. (1) Peter objected to the ruling on the East Devon CLP rule change only to be told that his point would be considered “at some future date”. (2) 25 contemporary motions disallowed but not referred to the NEC. They will be made available “soon”. (3) The very sensible suggestion that the NPF report should be voted on section-by-section was lost on a tied vote. What were the arguments advanced against it? The all or nothing approach ensures that few delegates read the document closely since the burden if rejecting the whole thing is far to great. On suspensions, expulsions and exclusions Iain McNicol said that all decisions were made by NEC panels. I think we need detail on this. How can we get it? I would hope ‘working class’ would be based on the Registrar General’s Social Scale (or the updated version – the name of which slips my mind at the moment but I have it in my office) based on social classes 3-6 and occupation parent/s. I think Conference has the final say on all these matters and if I was a delegate I would move reference back on adding the Scottish Leader and Welsh Leader- and Mayors and PCs and more Councillors – the Right are only doing this to try to undermine JC’s majority. I would also hope someone will move an emergency resolution on the lines: “With the massive increase in Labour membership to 500,000 plus thanks to the leadership of Jeremy Corbyn we instruct the NEC to immediately open an election for a further 6 CLP places on the NEC to be completed within one month and making a total of 12 CLP Reps from now on which better reflects the grassroots membership.” Or words to that effect. Why would you hope that socialists would take the official social scale (Registrar General or later e.g SOC90 to SOC2010) as the basis for discussing social class? SOC2010 has TU officiasl in group 1 and teachers, nurses and engineering professionals in group 2, so not working class on your definition. On the other hand it has town planners, brokers, insurance underwriters, dancers, musicians, estate agents in group 3 and therefore working class on your definition. Does this make sense to you? Are you confident that when people in the LP, like Peter W in the above report, use the term “working class” they are using in the sense you suggest? Even the grimmest of situations has its humorous bits. Re the suspensions etc. Perhaps the most hilarious of McNicol’s ” mistakes ” is denying Hilary Aked membership on the grounds that she supports the Tory Party. This was a decision made by McNicol himself, directly. One can only wonder if someone with such cognitive disadvantages is really fit to be GS of the Labour Party. Anyway I guess all of you folks are going to get behind the demand for an independent investigation of the purge. They should really retun their search-bots. Better still they should start supporting the fundamental democratic rights of the membership.